Super Street Fighter IV will include robust online tournament support, allowing anyone with a copy of the game to host their own, tiered online tournaments. The game's online Tournament Mode won't be shipping with the game, due to hit the PS3 and Xbox 360 on April 27, but will arrive on June 15 as a free download, game producer Yoshinori Ono told journalists. The online hosted tournaments can be launched from any copy of the game. A player could even decide to use their console as a host and not participate, Ono said. All of the tournaments will feature direct elimination, meaning one loss and you're out of the tourney. Capcom's Seth Killian said they decided not to include double elimination or other, more complex, tournament styles to cut down on potential confusion. The tournament I watched unfold last week featured eight game writers sitting at different monitors that were connected over a network that Ono said replicated the online experience. The players not fighting were able to watch the current fight and chat with headphones. After each round, the game loaded a tournament chart showing who had just fought and who had won. The chart auto updated as players progressed through the tournament until a final gamer won and the game showed a picture of a trophy. "The Tournament Mode allows you to have a proper arcade style tournament," Ono said. "The host can organize the tournament however he or she likes and edit details." That includes setting private slots and moving around those slots to control who fights who first, he said. The tournament mode supports four or eight player tourneys and replays from the tournament can be saved on the fly. Capcom also plans to support this new tournament mode, which won't be coming to Street Fighter IV, with tournaments of their own. The winner of the Capcom tournaments will receive a special, in-game digital trophy called the Sign of the Warrior. That title and trophy can be lost if the player with the title loses a tournament. 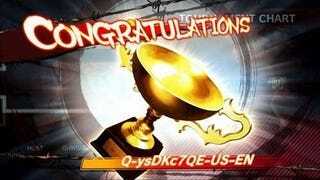 Ono added that Capcom will also be working with publications to create special trophies and titles. "If Crecente wanted to make a special tournament we could have a special title created just for that media outlet," Ono told the gathered press.